Mangyan refers to the eight indigenous tribes inhabiting the island of Mindoro, each with its own culture and language, with members predominantly employed in agriculture, hunting and gathering, and wage labor. One tribe, the Iraya (link to wiki page/website resources section), is an extremely impoverished and socially marginalized group. Having been pushed away from their ancestral lands has dramatically changed their way of life. Instead of being able to subsist solely by fishing, hunting, and gathering, many of them now resort to doing daily labor work, and others have been pushed to the streets to beg and to try and sell baskets and other trinkets. Culturally, the Irayas have a very different perception of cleanliness and hygiene than lowlanders do. Therefore, they are seen as dirty, which again carries a connotation of them being less intelligent. Besides the predominantly discriminatory attitude towards the Iraya Mangyans, lowlanders often blame them for local crime. The indigenous population easily becomes the scapegoat of the community. Since 1991, Stairway has been reaching out to the local Mangyans in Puerto Galera in an effort to help uplift the community from poverty and to help mitigate the discrimination against them. In 2009, we purchased 10 hectares of land in one of the Mangyan mountain communities called Baclayan. During the purchase process, we observed a community that was struggling on many levels. 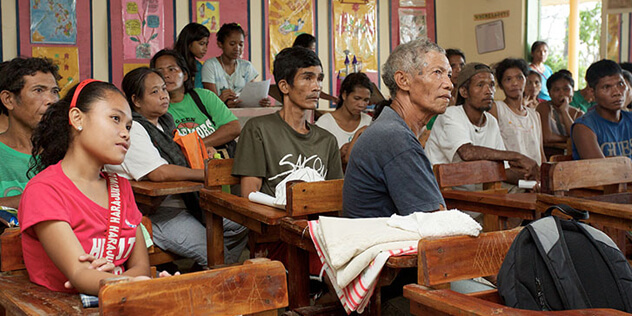 Thus, in 2011 we extended our community outreach to include the Baclayan village. Our overall vision for the indigenous project is still to break the perpetual cycle of poverty amongst the Mangyan people, eliminate discrimination towards this minority people, and mitigate teen marriages and early pregnancies; all through a sustainable and environmentally sound community development plan. Our main strategies to reach these long term goals are to enhance the quality of education and to increase the number of children attending school. Currently, there are four distinct ongoing initiatives in and with the Baclayan community: The Organic Farm, The School Feeding Program, The Health Project and the local Youth Empowerment Activities.